I realise that this is ridiculous and that the odds are stacked against me (starting a diet as a New years resolution, doing a ‘fad’ diet and generally going against the pressure of Conventional Wisdom) BUT the only time I ever lost weight and generally kept it off for a long period of time was when I did Atkins and I started on the 2nd Jan. Which according to my hazy memories, I did either 10 or 11 years ago. It took me between 3 and 4 years to gain weight again and I think I never gained quite as much as I previously weighed, so really it feels like the right thing to do. Anyway, I quite excited to be starting and I’m really really looking forwards to cracking this weight issue. I’m continuing to walk 3 or 4 miles a day (keeps the commuting costs down) and that’s going to suffice for exercise for the next month or so. When I feel a bit more like being active, I’ll start weigh training and possibly a little more running. Walking is enough for now. I’m also enjoying cooking different food. Except for the spring greens, which were utterly disgusting and a total horror! I’ve had them before in restaurants and they were delicious so I have no idea how steaming something and putting a little butter & lemon juice over them could make them so utterly disgusting! Neither of us could eat them. UGH! 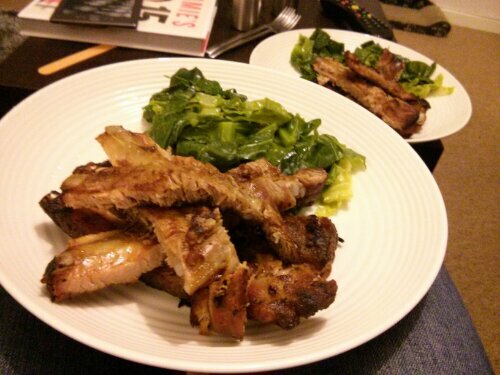 The ribs on the other hand were utterly delicious. I used the fabulous Felicity Cloake’s recipe from the Guardian and really, she never get it wrong. 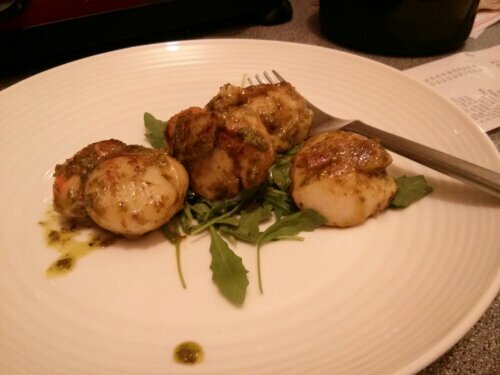 We actually started with some scallops which I got from the fishmonger at Sainsbury at a bargainous price of £2.50 for 9 of the huge monsters and they were utterly delicious. Soft and buttery and then I cooked them in a little pesto and they were delicious. So really, for a first nights diet dinner, it wasn’t exactly a hardship! Tonight was also lovely, but unphotographed – steak (okay this was really chewy), big mushroom stuffed with Simon’s homemade cheese, garlic and thyme plus some asparagus spears cooked with lemon juice and a little soy sauce. Today was 19g of carbs and yesterday was 17g of carbs. Tomorrow’s menu plan is scrambled eggs & ham, trout fillet & salad, chicken breast & curly kale & courgettes. 3 January 2013 in Diet, Uncategorized. FYI We are still on 5:2 no great hardship. Yeah, I don’t think I ever needed the psyllium husks, luckily! And yes, it was definitely RatioOne time! Are you still enjoying it? I really really struggled with intermittent fasting and have since read that it’s not great for women. Simon hasn’t struggled at all. I think its easier on boys as we are more effective when we have hard clear boundary’s/rules. Knowing its only for short period of time (tomorrow I can stuff my face) means the window for cheating is tiny. With fat kins, I got to the desperate point where you got me making “Fake bread sarnies” which was effectively 2 slices of almond cake/omelet with cheese and salad cream in side. That’s cool and I’m really pleased that it’s still working for you. I like Atkins but I do know that eventually I will go back to eating more carbs – I think it’s impossible to stick to a tiny amount forever! Once I am down to a more normal weight, I’ll probably start upping carbs to about 100-150g a day which is pretty liveable with – that’s a couple of slices of toast / porridge, a salad lunch and a normal dinner. I was managing that before, just not really losing weight.